The iMovie app allows you to edit videos on your iPhone, and can produce some very interesting results. But the app also uses about 650 MB of space, which you might prefer to use for other apps, music, or videos. Our guide below will show you how to delete the iMovie app from your iPhone in the iOS 10 operating system. The steps in this guide are going to delete the default iMovie app that came on your iPhone 7. These steps were performed on an iPhone 7 Plus, in iOS 10.2. These steps will work for other iPhone models running iOS 10 or higher. If you decide later that you would like to re-download the iMovie app to your iPhone, you can open the App Store, select the Search option, then search for iMovie and tap the cloud icon to the right of the app. 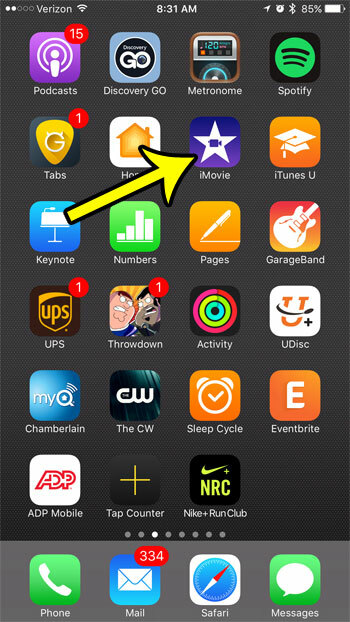 Step 1: Locate the iMovie app on your iPhone’s Home screen. If you don’t see it on the current Home screen, you may need to swipe left or right until you find it. Step 2: Tap and hold on the iMovie app icon for a few seconds until the app starts to shake, and a small x appears at the top-left of the icon. Tap the x when it appears. If you instead see options for New Movie and Share iMovie, then you pressed too hard on the screen. Try again, but use less force. If you start to see a gray box appear around the icon, you are pressing too hard. 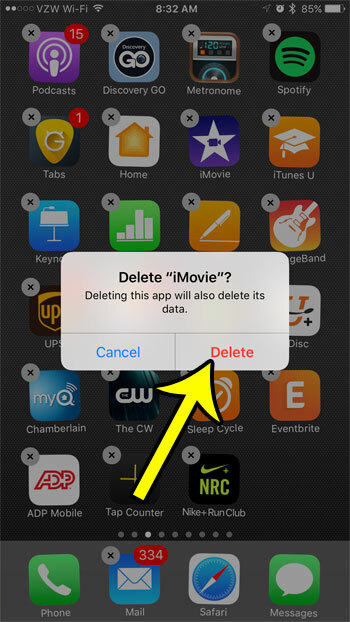 Step 3: Tap the Delete option to delete the iMovie app from your iPhone. You can use a similar method if you want to delete the GarageBand app from your iPhone, too. 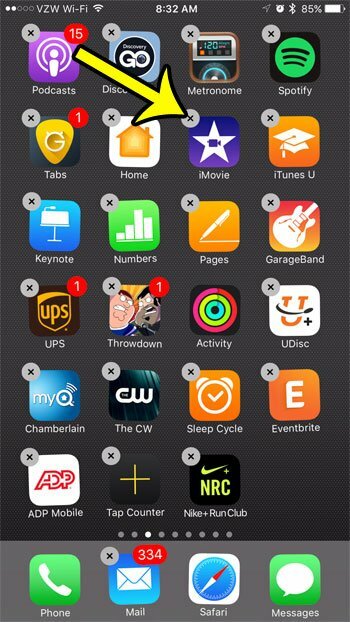 Since space is at such a premium on iPhones, it is very helpful to delete any of the apps that you aren’t using, especially these default ones that can take up a lot of space.